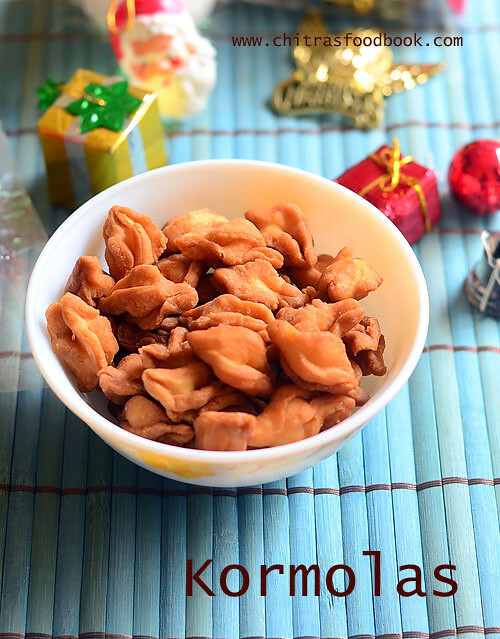 Kormolas is a Goan special Christmas sweets recipe. 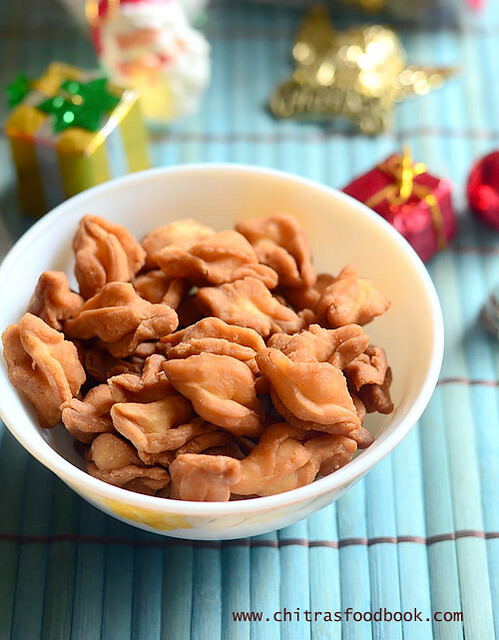 Traditionally the Christmas goodies, called kuswar are specially prepared by the Catholics in Goa and are distributed to neighbors, friends and relatives during Christmas. It is very similar to Kulkul/ Gala Gala in ingredients and the method of preparation. But its shape is different. Authentically Kormolas is prepared with all purpose flour, sugar, egg, semolina and coconut milk. But I tried an eggless version following the recipe of Hilda’s Touch of Spice. It came out really well with a crunchy taste even without egg and tasted mildly sweet. Though I couldn’t make proper shapes, we loved its taste very much. Friends do try this easy, yummy Kormolas recipe during this Christmas. I am sure your family members would enjoy it to the core. Lets see how to make this Goan special Christmas sweet recipe – KORMOLAS with step by step pictures. Check out my Kerala special Achappam/Rose cookies recipe and Goan KULKUL/KALKAL too. Powder the sugar and keep aside. Take a wide bowl and add maida,salt and powdered sugar. ( If you powder 1/3 cup of sugar, you will get around 1/2 cup. Use all the sugar.) Mix well and check for taste.If sweetness is less,add more powdered sugar as per your taste. Melt the ghee and let it become warm. Add it to the maida mixture and make a crumbly mixture. Ghee should spread all over the maida. Divide the dough into 2 balls. Take one ball and dust it lightly with maida. Roll it thin to a circle. Trim the edges to bring square shape. Cut into small squares. Make shapes immediately. Do not dry it for long time. Take one square and join one of the opposite edges. Pull the other two edges in the opposite direction and join them. Make a twist at both the ends to give a bud like shape. If you don’t twist it properly, it will open up while frying. Please refer the pictures below to get the idea. Lower the flame completely and drop a batch of kormolas at a time.Flame should be low to medium.Let them cook for few minutes till one side turns light golden brown.Flip it and cook the other side till light golden brown. Don’t wait for all the bubbles to cease because kormolas will cook even after removing from the oil. So remove it as soon as it turns golden. While you take out from the oil,it looks & tastes soft. But when it cools down completely,it will become super crunchy and becomes dark in color too.So please wait till it cools down to enjoy its best taste.Cook the remaining kormolas in batches.Adjust the flame from low to medium whenever needed. Store in an air tight box after it cools down completely.It stays good for a week or two.Enjoy this crispy and yummy snack with your family ! Suppose if you add excess milk and make the dough very sticky,add some more maida to it. If you add more ghee,Kormolas will break in oil.So add the mentioned amount. If the heat of oil is more,the color of kormolas turn golden brown quickly without cooking inside.So deep fry them in low to medium heat oil for uniform cooking. Kormolas will absorb more oil if you fry them in low insufficient heat.So deep fry in proper heat. 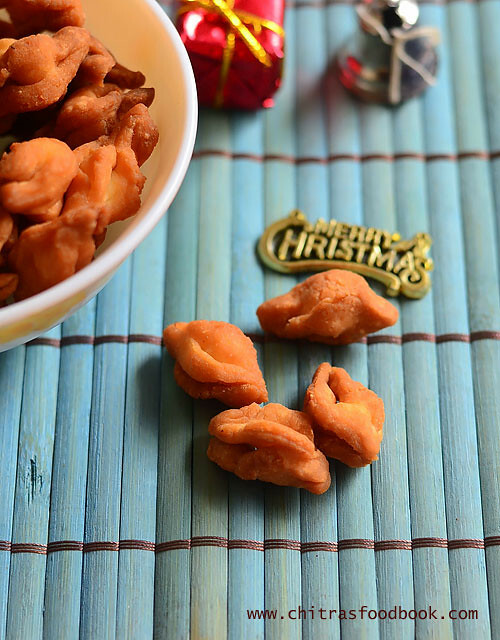 Enjoy this crispy Goan special Christmas sweet at home !! Merry Christmas ! I had a pack of black dates lying in my pantry for months. 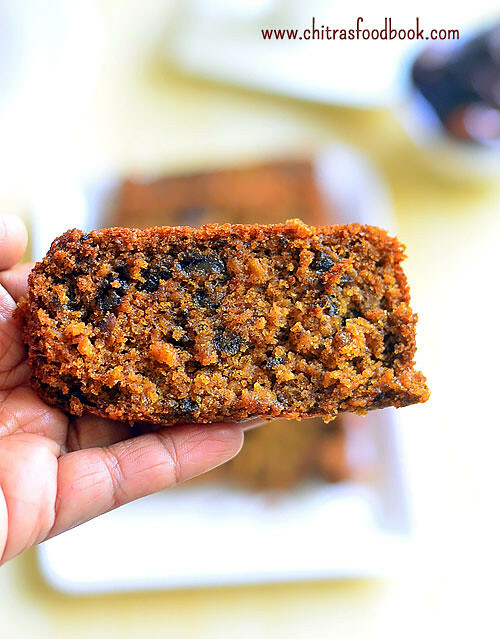 I found dates cake would be the best option to finish off the leftover. So I tried it following THIS healthy, no egg, no butter date cake recipe using whole wheat flour and instant oats.As this cake recipe is without butter, condensed milk I was doubtful about the texture of cake and flavor .But to my surprise, it came out very well with an awesome flavor just like Christmas fruit cake.It tasted great and secured 100 marks in my home .Yeah Raksha and Sendhil loved it a lot. Unless you say, no one could find out that this cake is made with dates, whole wheat flour and oats. Its texture was very soft and spongy. As my cake had cracks on top, I have given some suggestions below to avoid it.This cake can be made in pressure cooker as well. 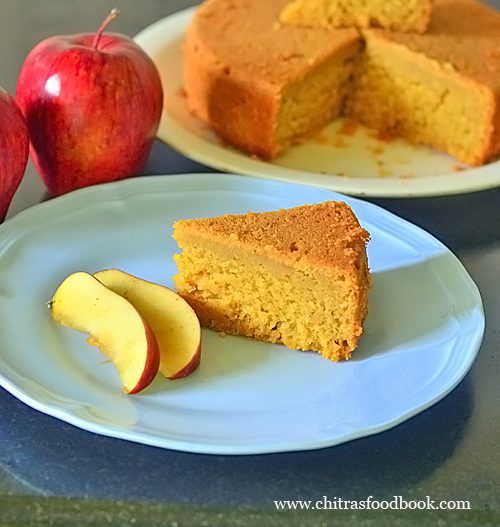 I strongly recommend everyone to try this recipe at home to enjoy a gluten free cake.I am sure its result won’t disappoint you. You can add chopped walnuts, cashews and almonds to make it more healthy. 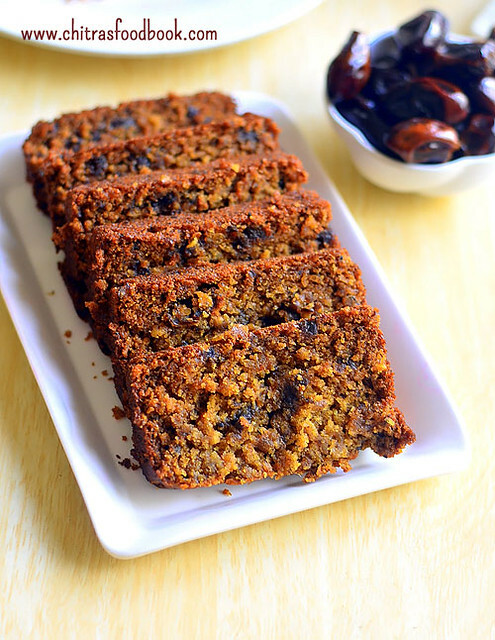 So try this healthy, guilt free, eggless dates cake recipe at home (Indian Khajoor cake) and share your feedback with me . Lets see how to make it with step by step photos. 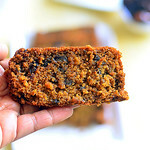 Check out my eggless, butter less banana cake too ! 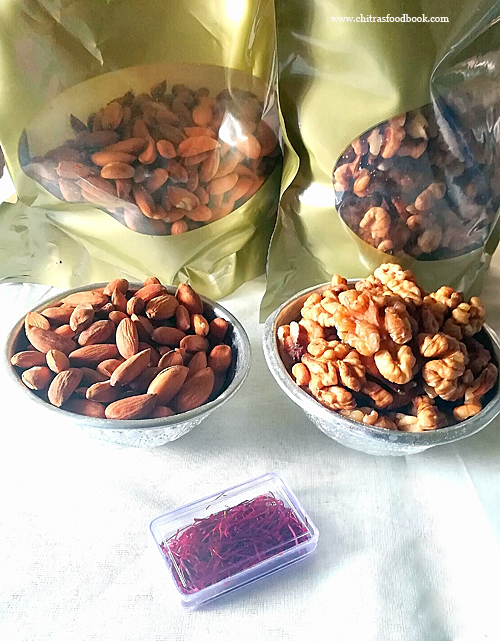 Deseed, chop and grind the dates in batches. Heat 1.5 cups of milk and add the ground dates to the hot milk. Let it soak for 10 minutes. If using brown dates, soak for 30 minutes. In the mean time, mix the dry ingredients. Add vanilla essence and cooking oil to the soaked dates + milk.Mix well with a whisk. In a wide bowl, take the whole wheat flour, oats, baking powder, baking soda and sugar.Mix well. Add the wet mixture to the dry flour mixture. Mix well with a whisk. Do not over beat. Just mix gently in one direction.Cake batter looks thick but pourable.See the picture below. Grease a baking pan ( I used loaf pan) with oil and pour the cake batter till 3/4th of the pan.Preheat oven in convection mode at 180c. Keep the baking pan inside the oven.Bake the cake for 30 - 35 minutes. Insert a toothpick or back of a spoon in the center of cake. If the spoon comes out clean, cake is done. If not, bake for another 5 minutes. I baked for 40 minutes but cake had cracks on top and the crust was slightly roasted.So I feel 35 minutes baking time would be enough. So keep an eye after 30 minutes. Remove the baking pan and let the cake cool down completely. Do not try to remove the cake. It will break. After the cake is cooled down, run a knife on the sides of cake and invert the pan on a plate. Just pat it. Cake comes off easily. Make slices and enjoy ! Cake tastes more sweet on first day. But it tasted perfect the next day. This cake stays good for 2 days. Store in an airtight box. No need to refrigerate. Its a great teatime snack ! Enjoy !! Add more dates and less sugar if you want natural sweetness in the cake. Do not skip vanilla essence as it gives a nice smell when combined with dates. Baking time depends on the heat of oven.Keep an eye after 30 minutes and check with a spoon. Do not over bake. This cake is too soft and moist. It may break or crumble. Cut slices carefully! If using brown dates, soak for 30 minutes in milk. Do not grind all the dates in one time. It will stuck to the walls of mixer. So chop the dates and grind 4-5 in one batch. 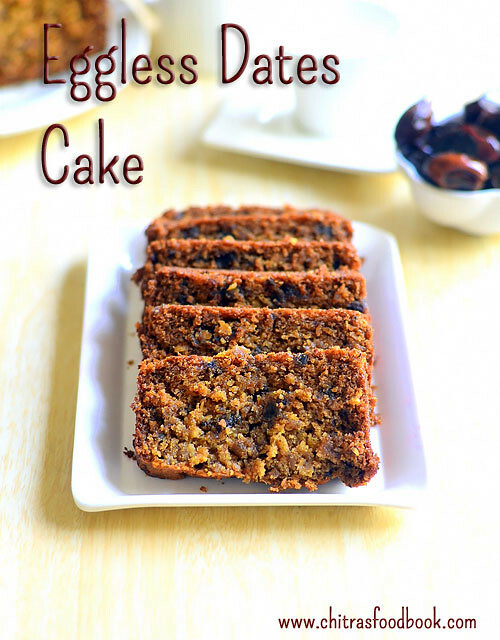 Enjoy this super soft, moist, guilt free, eggless dates cake recipe ~! During Diwali, I shared a post on how to make Gulab jamun using store bought, Instant MTR gulab jamun mix. 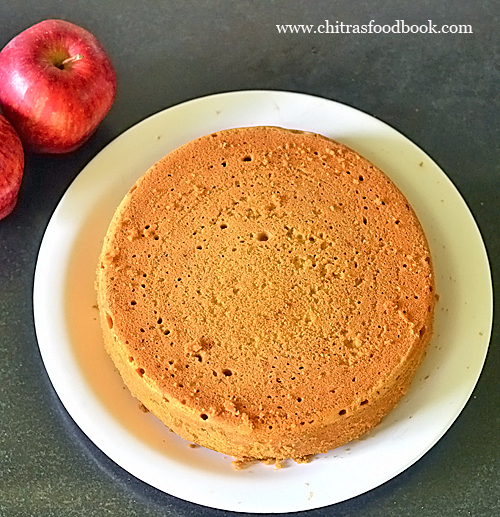 As I got two packets of gulab jamun powder in buy one get one offer, I had another pack of gulab jamun mix leftover in my pantry.As I had already shared a jamun kofta gravy recipe, I was looking for some other interesting recipes with gulab jamun mix and came across this eggless vanilla sponge cake recipe. 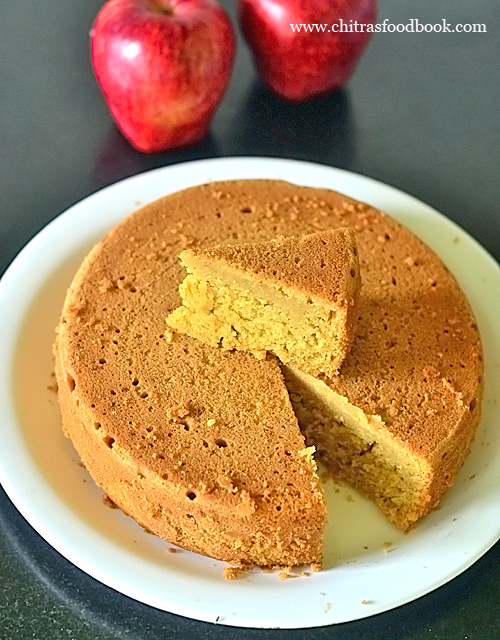 I tried the recipe with small changes and the cake came out super soft, spongy and moist. Raksha loved it a lot and took it for her school Christmas & New year party. She said, all the cake pieces vanished in no time and it got rave reviews from her friends. I was very happy and wanted to share this easy, foolproof eggless vanilla cake recipe with you all. So I made this as my first ever guest post in my blogger buddy Lubna Karim’s blog “ Yummy Food”. Today I have shared the same recipe with step by step photos. Friends, If you are looking for some easy, yummy recipes using left over gulab jamun mix, this is one of the best options.Do try it for this New year celebration and enjoy ! 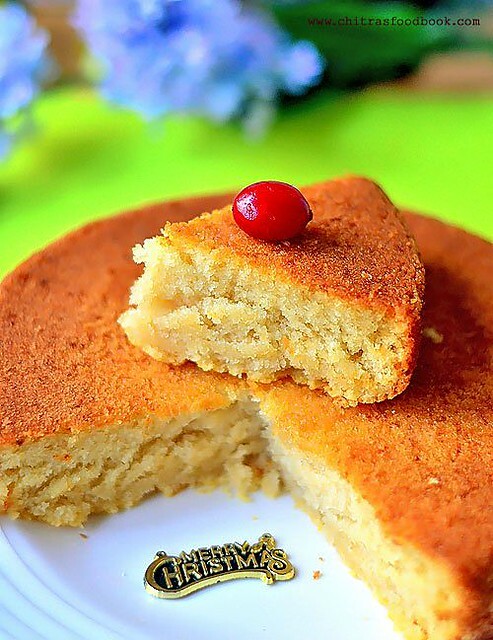 Its a best teatime cake recipe. Ok, Lets see how to make eggless vanilla sponge cake recipe using gulab jamun mix. With this cake recipe, I am signing off this year 2016.I thank all my readers and friends for your continuous support and encouragement . With new hopes and dreams, I will catch you all in New year 2017 with a sweet recipe. I Wish all my readers a very happy and prosperous NEW YEAR 2017 !! 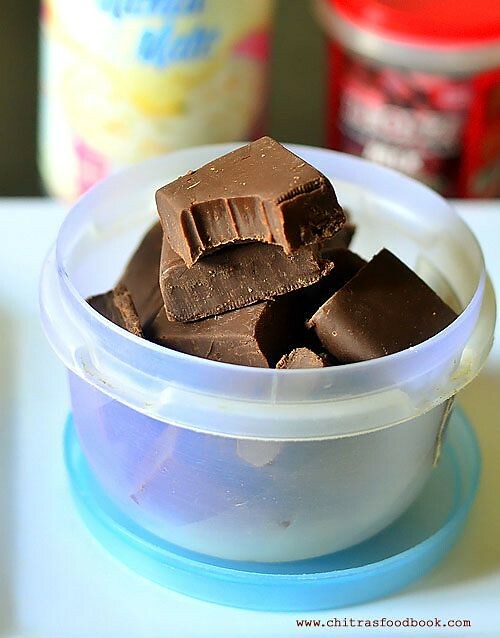 I have never thought that making homemade chocolate fudge is so easy until I come across THIS easy, microwave chocolate fudge recipe with just 2 ingredients. As I wanted to share some easy recipe for Christmas & New year celebrations, I thought of posting this simple dessert recipe with you all. Basically old fashioned homemade fudge is made using cocoa powder, sugar, milk, butter and vanilla extract from scratch. 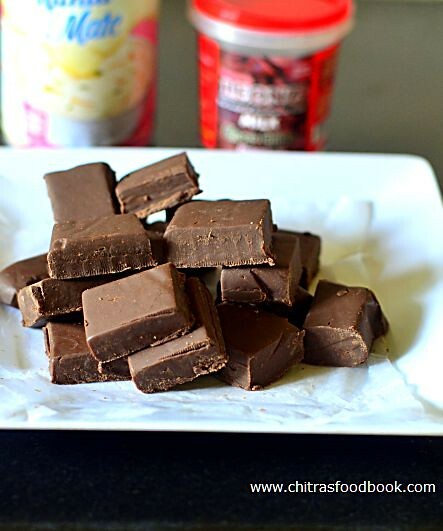 But this is an easy and quick Chocolate fudge recipe with just 2 ingredients - Sweetened Condensed milk & Choco chips. It came out really well with soft, chewy texture. I have used microwave to melt the Choco chips. It can be done on stove top as well.You can make any number of variations in this recipe by adding nuts, raisins, variety of choco chips like dark, milk choco chips etc. Do try this easy homemade vanilla chocolate fudge recipe with condensed milk. I am sure you will love it a lot. 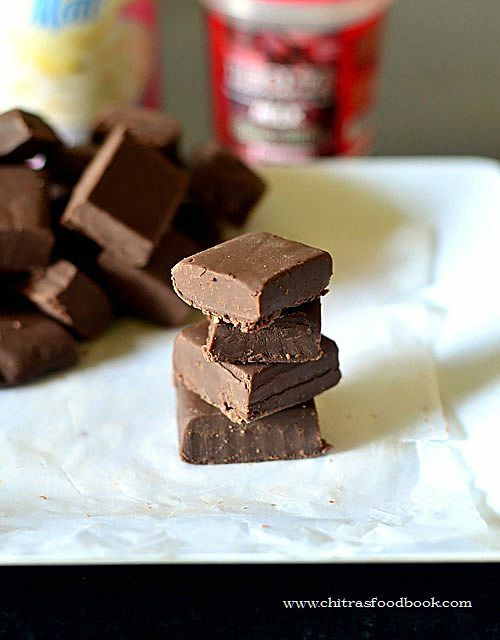 Lets see how to make this easy chocolate fudge using 2 ingredients with step by step photos and a video ! Line a baking pan with parchment paper or thermal foil sheet. Microwave in high power (800w) for just 1 minute. Remove the bowl and mix well with a spatula till all the Choco chips melt completely. Add Vanilla essence and mix quickly. Mixture will start to thicken. Immediately transfer the mixture to the baking pan. Level it with a spatula and pat it twice. Refrigerate the fudge for 1 hour. Invert the fudge in a plate and peel the butter paper. Cut into squares and serve ! It stays good for 2-3 days without refrigeration. I used a combination of dark & milk Choco chips in this recipe. You can use any as u wish. Do not cook the mixture for more than 1 minute in microwave. Its enough for the Choco chips to melt. If not, keep for just 30 seconds more. For variations, you can add finely chopped nuts, raisins, pecans to the melted chocolate.Just play around. Enjoy this easy, yummy chocolate fudge for Christmas & New year celebrations !! The below picture is fudge after a bite !